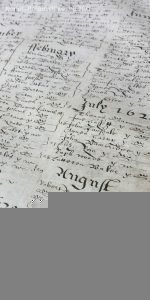 Great Yarmouth’s first parish register records baptisms, marriages and burials which took place in the town from 1558 to 1653. The register contains more than 130,000 names. This makes it a vital resource for local and family historians in England and around the world. Famously, the register links Great Yarmouth with the Salem witch trials in the United States. The register is an integral part of Great Yarmouth’s history and helps prove it was a populous and influential place. However, the register is in a poor physical condition. NORAH, together with the Towne Family Association, has raised £2,800 in order to repair the document. 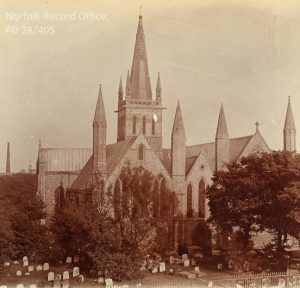 After the register has been conserved, it will be shown to groups visiting the Norfolk Record Office in Norwich, where the register is permanently stored. The conservation work and the contents of the register will be the subject of an event at Great Yarmouth Minster on 5 March 2018. This register is clear evidence of Great Yarmouth’s size. According to research based on the hearth tax of 1662, just nine years after the last entry in the register, Great Yarmouth was the seventh largest city or town in England, after London. In the 1520s, a similar population survey, lists Great Yarmouth as being the twentieth most populous place outside London. This register therefore documents the gradual increase in population during the latter half of the sixteenth century and the early part of the seventeenth century. This register is almost certainly a copy of an earlier document. There are two reasons for this. Firstly, the register is made of parchment. Elizabeth I’s order of 1598 stated that churches should use parchment registers as they are more robust than paper. In addition, the order demanded churches to copy paper registers on to parchment. Secondly, the register starts in 1558, which is when Elizabeth’s reign began. Most churches felt the order only required them to copy entries which took place during Elizabeth’s reign. For an introduction to Norfolk’s parish registers, see the Norfolk Record Office’s exhibition guide on the subject. During the period which this register covers, St Nicholas was the only church in a very large town. Coupled with the fact that it covers a relatively large time period, it is no surprise that it contains so many names. The register documents about 67,000 separate events and lists about 138,000 names. This number does include duplicates, but nonetheless, it is a tremendous resource for family and local historians. For many of the names given in the register, this is the only evidence of their existence. And as explained below, many of the people mentioned in the register, or their descendants, have moved away from Great Yarmouth to other parts of the world, especially the United States. The document’s influence extends beyond east Norfolk. Great Yarmouth’s first parish register also prove snippets of additional information which provide more insight into the people who lived or visited Great Yarmouth. For example, John Brocker, who was buried on 14 February 1646 is described as a Dutchman. In the same year, it is recorded that Olive Estoe was 106 when she died. Towards the end of the register, occupations are often included as well as names of churchwardens and bailiffs. Understanding what is written is fairly straightforward, even though some of the register’s entries are in Latin. The handwriting is generally legible but some of the entries do require a little patience to decipher. The register does use Old Style dates, which means the year starts on Lady Day which is 25 March, rather than preceding 1 January. For entries dated 1 January to 24 March add one to the cited year to convert the date to a New Style. The change to New Style dates took place in 1752. Matthew Hopkins was a witch-finder who operated in East Anglia between 1645 and 1647. In July 1645, 19 women from Manningtree in Essex were executed for witchcraft and Hopkins was heavily involved in several of the cases. Accusations of witchcraft then spread to Suffolk where over forty alleged witches were executed. Trials of witches continued in Norfolk and Cambridgeshire, including in Great Yarmouth following an invitation to Hopkins by the Borough. On 13 September 1645, it is recorded in Great Yarmouth’s first parish register that Al[ic]e Chippwell, Elizabeth Bardwell, Elizabeth Bugden, Bridggett Howard and Marye Blackourne were ‘executed for witchcraft’. Names of the five witches executed in Great Yarmouth for witchcraft in September 1645. Matthew Hopkins is not the only link with witchcraft in the register. Some of the people recorded in the register have links to the Salem witch trials. In about 1640, William Towne and his wife Joanna Towne née Blessing emigrated to Salem in colonial Massachusetts with their children. The Great Yarmouth register records their marriage on 25 April 1620 and the baptisms of several of their children. Two of their daughters who were baptised in Yarmouth, namely Mary Eastey née Towne and Rebecca Nurse née Towne, were later convicted of witchcraft and executed. Their sister, Sarah Cloyce née Towne, was also accused of witchcraft. However, she was able to successfully defend herself against the charges. All three women had strong reputations for piety and charity. It is this which eventually helped end the witch hunt. The Towne Family Association contains descendants of the Towne family. Recently, many of its members visited England from the United States. They went to places where their ancestors once lived. As a result, they have given a generous donation to NORAH to help with this appeal. Baptism entries of Mary [written as Marie] Towne and Rebecca [Rebecka] Towne on 24 August 1634 and 21 February 1621 respectively. The volume requires active conservation so it to be handled without risking the permanent loss of information. This appeal will enable professional parchment conservators at the NRO to carry out the required work. They will repair 20 of the damaged parchment pages and then repair the front and back boards of the register’s binding. In doing so, they will remove leather from the boards, carry out the required repairs to the boards and put back the original leather. 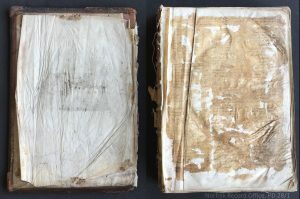 Finally, the conservators will re-sew the pages together and re-bind the volume. The register will feature at public events and to groups visiting the NRO. A public lecture is due to take place at Great Yarmouth Minster on 5 March 2018. At this talk, members of the public will be able to learn more about the register and its contents and to find out how the register was conserved. The NRO will also make high quality digital images of the conserved pages. This will be particularly useful for the first few pages of the volume which have suffered damage due to the broken spine. The first parish register is just one of more than 100 Great Yarmouth registers which are considered to be so fragile that they cannot be produced to members of the public or shown to groups visiting the Norfolk Record Office. Many of the registers were damaged during the Second World War when bombs destroyed much of the church of St Nicholas.